When the Swedish-American music production three-piece Miike Snow released their self-titled debut album it was met with mixed reviews. After producing hits such as Britney Spears’ “Toxic” (co-written and co-produced by two members of the band, in the past when they are known hit makers Bloodshy & Avant) and their claim to fame, “Animal”, their follow up, Happy to You, might not be the that highly anticipated event their label said it was going to be. The trio’s sophomore album, Happy to You, is more carefully made and less immediate than their self-titled. This was a time when Miike Snow brought to the front the feel of a more solemn Gnarles Barkely. Miike Snow were underground electro-pop musicians pushing the envelope and not afraid to churn out mainstream hooks. Fast-forward to Happy to You, where hooks have less emphasis and are replaced with muted dazy beats; as aforementioned it’s a smarter and more carefully put together album, but ultimately less satisfying. That goes to say nothing on the album tops “Animal” although the outstanding “Devil’s Work,” an upheaval of horns, strings and vigorous piano riffs, is a close contender. A military beat, contrastingly relaxed and unhurried vocals and a sharp hook provide “The Wave” with a delectable zest. Yet this is only the start of catchy tunes. “Paddling Out”‘s charm hinges on spirited house piano and accompanying early-90’s elation, with “God Help This Divorce” amalgamating arch-MGMT-like falsetto vocals with a serene folk which will get your body moving. Surprisingly, Lykke Li, determined resuscitator of the dullest songs, cannot do much to help the fait of the spiraling synth track “Black Tin Box”. 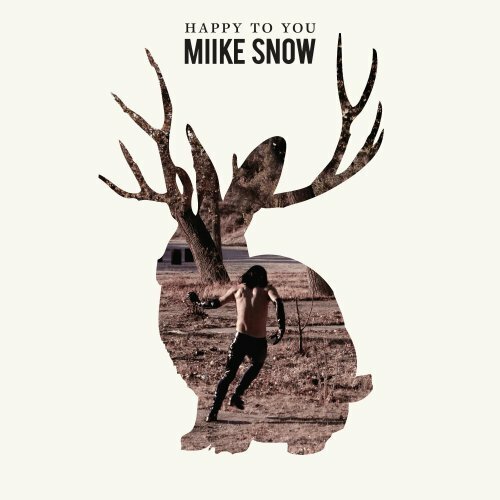 What Miike Snow urgently needs at this moment is that hit, one like “Animal”, which will launch them in the mainstream music world. In spite of this Miike Snow are rocking out in a much better spot then they ever would have expected. Happy to You, is still a giant step in the right direction, a giant step that we never thought they would make.